Now with USEF.energy programs! Download through the icon above. Until now there was no such thing as a standardized Demand Response (DR) program. Each DR program design tends to be unique, fitting the structural and regulatory requirements of the geographic region it is deployed in. For each DR program there are numerous possible deployment scenarios involving a variety of factors. Automating DR programs is the goal of the OpenADR Alliance and the OpenADR 2 standard. While OpenADR clearly defines the expected behavior when exchanging DR event related information, a number of OpenADR characteristics such as the event signals used, the reports required, and the targeting methods used are deployment dependent. 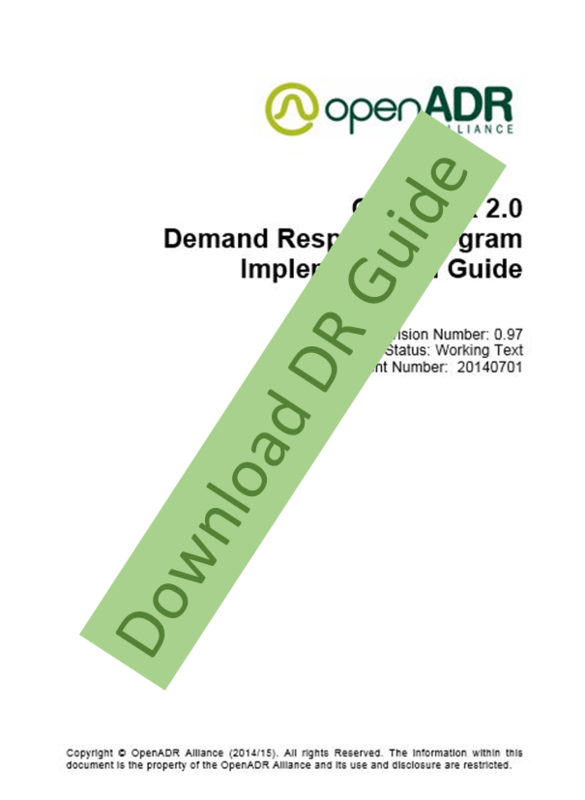 The OpenADR Alliance has developed a DR Program Implementation Guide and Certification Program with the goal of standardizing the use of OpenADR in specific commonly used Demand Response programs. 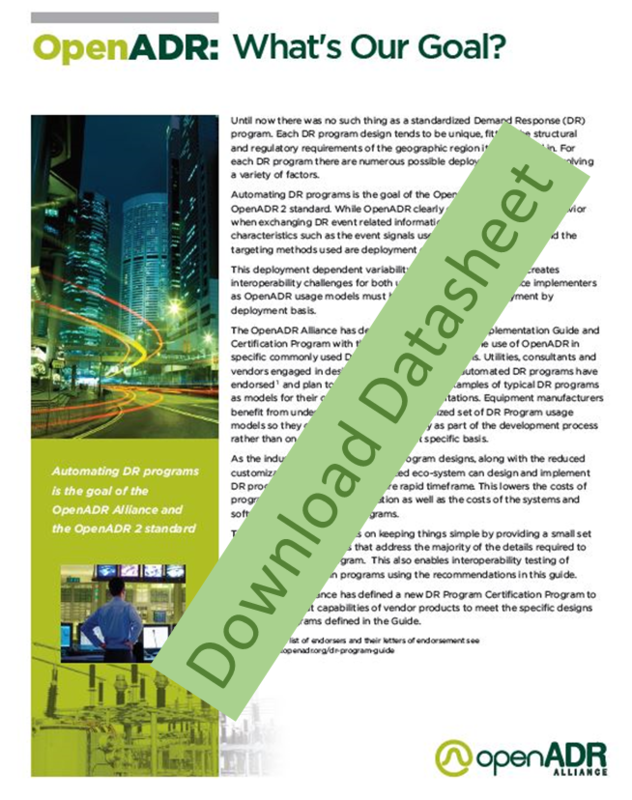 The Guide contains templates for the most common DR programs. 1. Critical Peak Pricing (CPP): Rate and/or price structure designed to encourage reduced consumption during periods of high wholesale market prices or system contingencies by imposing a pre-specified high rate or price for a limited number of days or hours. 2. Capacity Bidding Program (CPB): A program which allows a demand resource in retail and wholesale markets to offer load reductions at a price, or to identify how much load it is willing to curtail at a specific price. 3. Thermostat Program (Thermostat)/Direct Load Control (DLC): A demand response activity by which the program sponsor remotely controls a customer’s electrical equipment (e.g. air conditioner) on short notice. These programs are primarily offered to residential or small commercial customers. 4. Fast DR Dispatch (Fast DR)/Ancillary Services Program: A demand response program that provides incentive payments to customers for load response during an Emergency Demand Response Event. An abnormal system condition (for example, system constraints and local capacity constraints) that requires automatic or immediate manual action to prevent or limit the failure of transmission facilities or generation supply that could adversely affect the reliability of the Bulk Electric System. These type of programs may sometimes be referred to as “Ancillary Services”. 5. Residential Electric Vehicle (EV Charging) DR Program: A demand response activity by which the cost of charging electric vehicles is modified to cause consumers to shift consumption patterns. 6. Public Station Electric Vehicle (EV Charging) Real-Time Pricing Program: A demand response activity which aims to more efficiently match the price of charging at work or public charging stations to the cost of electricity. 7. Distributed Energy Resources (DER) DR Program: A demand response activity utilized to smooth the integration of distribute energy resources into the smart grid. The OpenADR Alliance has developed a new DR Program Guide Certification Program designed to further the interoperability of products certified as OpenADR compliant. The new Certification is a simple add-on to the current OpenADR “b” Profile Certification that is being required by utilities worldwide. 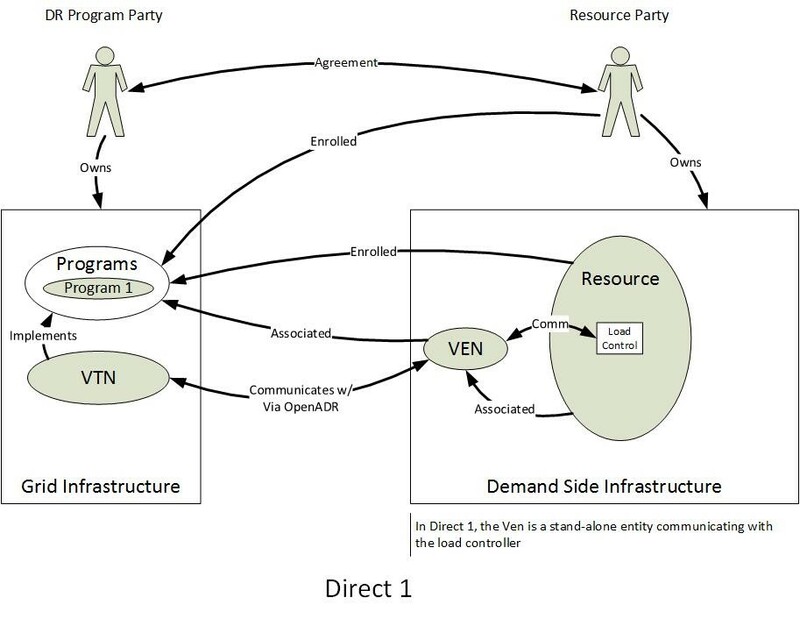 The test harness can validate interoperability of VTNs and VENs supporting programs defined in the guide.